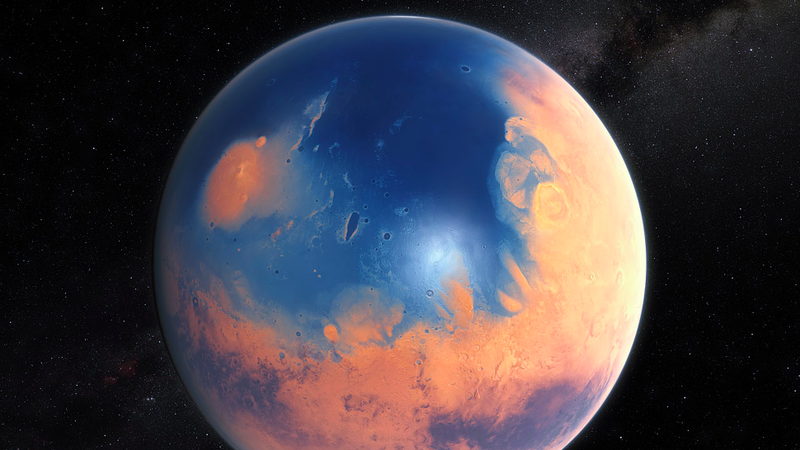 Mars once featured a vast ocean that covered its northern hemisphere. New evidence suggests this Martian sea experienced at least two “mega-tsunamis” that were triggered by meteor impacts. Traces of these cataclysmic events can still be seen on the Martian surface, and they could still contain traces of ancient life. Giant oceans and massive tsunamis aren’t the first things that come to mind when we think of Mars, but this planet used to be quite different. About 3.4 billion years ago, groundwater outbursts unleashed a torrent of water that produced a cold and salty ocean that covered the planet’s northern lowlands. In some regions it was about a mile deep. It may have even fostered microbial life. Eventually, however, the climate changed on Mars, and most of the water evaporated into space. That’s the theory, anyway. This idea is based primarily on estimates of how much water Mars once had and where it settled on the surface. But very little observational data actually exists. Given the absence of clear-cut shoreline features, scientists aren’t entirely certain that a grand northern ocean once graced the Red Planet. But new evidence presented by scientists from the Planetary Science Institute in Tucson, Arizona is offering the strongest proof yet that a northern ocean once existed on Mars—an ocean that bore witness to two powerful mega-tsunamis. PSI researcher J. Alex P. Rodriguez and his colleagues from Cornell University recently conducted a detailed surface analysis of the northern plains of Mars. They discovered traces of a former ocean—though not exactly where one might expect. The geologic shape of Mars’ ancient shorelines and its immediate inland areas indicates that two large meteorites—striking the planet millions of years apart—triggered a pair of mega-tsunamis. The resulting waves, which moved several hundreds of miles inland, reshaped the Martian landscape, leaving surface features that are still visible today. The two meteor impacts produced craters about 19 miles (30 km) wide, and would have generated tsunami waves that reached 400 feet (120 meters) high. By comparison, the tsunami that struck Japan in 2011 reached a maximum height of 128 feet (39 meters). When the first tsunami struck, it created widespread backwash channels that carried water back to the sea. These features are still visible today in the form of vast sedimentary deposits. The second impact happened a few million years later (a large meteor smashes into Mars about once every 3 million years). But by this stage in Martian history, the climate had become considerably colder. Water was turning to ice, and the original shoreline had receded inwards. The second mega-tsunami left different physical evidence behind, including rounded lobes of ice. As the receding tsunami water turned to ice, the lobes maintained their boundaries and flow-related shapes. This suggests that the water was saturated with salt—which, from a habitability perspective, is very good news. Salt keeps water in a liquid state, and that’s important for the emergence of life. “The astrobiological implications are enormous,” Rodriguez told Gizmodo. To explore this idea further—and to assist future missions to Mars—the researchers identified regions that were inundated by tsunami waters, particularly areas in which displaced sediment appears, and where salty or mineral deposits were left behind after the water evaporated. These will be good destinations for a future rover—or human explorers—to investigate.